Chicago: Haymarket Books, 2017, 304 pp. The collection’s first essay reviews the speculations of a host of international and American thinkers about the failure of socialist mass movements to take root in the United States. Among those whose ideas are thoughtfully examined here and in other essays are Werner Sombart, Selig Perlman, Karl Kautsky, Hal Draper, James Boggs, Eleanor Marx, Bertram Wolfe, and Paul Sweezy. Other essays deal with the Haymarket anarcho-socialists of 1886, Brookwood Labor College, Students for a Democratic Society, social media, C.L.R. James, the New Left, the Occupy movement, Trotskyist organizations, and Martin Luther King Jr.
Left Americana offers an open-minded overview of these select experiences and thinkers in the context of “what is to be done” in the United States. Le Blanc does not seek or offer a formula, he simply asks that leftists think anew about what kind of organization and political agenda is needed to overcome the global triumph of capitalism. How can an organization be thoroughly democratic, yet disciplined enough to be successful without simply replicating the authoritarian society it wishes to replace? 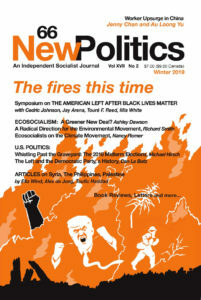 What specific national factors must American radicals take into account? The only given, in Le Blanc’s view, is that a viable U.S. left movement must exemplify the values and governance of the new society it advocates. This study of actual movements seeks to pinpoint the factors that thwarted long-term development. Le Blanc examines how some movements had such a weak organizational structure that they were unable to resist nationally coordinated government suppression. Other movements were so rigid or so dominated by a single personality that they withered when the leader floundered, became autocratic, or was killed. A perennial dilemma is how a movement reacts to dissenters when consensus on how to proceed is illusive. Le Blanc concludes that at present there is not even an “embryo” or “nucleus” for an organization that strongly advocates the end of capitalism. Consequently, he believes activism should not focus on trying to consolidate existing organizations, but on fostering dynamic united fronts. That immediate prospective, however, needs to be augmented with “serious minded” reflection and study of the experiences of past left movements to determine how to balance organizational discipline with freedom while retaining the efficiency required to prosper. DAN GEORGAKAS is the co-author of Detroit I Do Mind Dying, a history of the League of Revolutionary Black Workers, and co-editor of the Encyclopedia of the American Left.